A while back, I wrote about a very exciting if baffling new space propulsion system: the EmDrive. It’s a space propulsion system that doesn’t appear to use any propellant, maybe violates the known laws of physics, but somehow seems—according to a number of tests—to actually work. Physicist M.E. McCulloch released a possible explanation, but it just brings up more questions. When I say that it brings up more questions, I mean that to me it brings up dog-like head tilts as my feeble brain tries to process the complex explanation. The EmDrive is a new form of spacecraft propulsion technology that would run on solar power, uses essentially no fuel, and allows for speeds that could get us to Mars in about 10 weeks, significantly faster than the current transit time of about 260 days. That all sounds great! But maybe too great. The problem is the drive seems to violate accepted rules of physics. The EmDrive works by bouncing microwaves around an enclosed chamber, and not the usual action/reaction method of chemical thrusters or even ion engines. It’d be like being able to drive by pushing really hard on the steering wheel. It just doesn’t seem to make sense. And yet, several teams, building their own copies of the EmDrive, have been able to measure thrust. We don’t have a peer-reviewed paper yet, but something is being measured, and right now nobody’s sure what’s going on. But there is that new theory I mentioned above. Thankfully, to explain what this new theory is explaining, we don’t have to rely on my factory-remaindered brain; we have access to the brain (and associated bodily housing) of our tame physicist, Dr. Stephen Granade. I asked Dr. Granade if he could help us evaluate how MIT Technology Review is explaining McCullough’s theory of how the EmDrive could work, and the strange connection they’re making with the so-called “Pioneer Anomoly.” The explanation MIT gives is interesting, but, as you’ll see here, it conflicts with a lot of what’s known about relativity, and sort of makes Einstein into a filthy liar. Sort of. Other outlets are talking about MIT’s explanation and theories, but I think it’s compelling enough for us to try and take a deep look at what may be happening. I do hope eventually this thing is proven to work, but until then, here’s what someone smarter than me can tell us about it. Essentially, what Dr. Granade has deduced is that McCulloch’s theory relies on an obscure form or radiation and, and here’s the big part, that gravitational and intertial mass are not the same. Right now, for the accepted general relativity to work, they would need to be the same. If inertial mass is less than gravitational mass, as is suggested here, you’d need less force to overcome inertia and get the body in motion. So, the EmDrive might sort of be acting as an intertial-mass reduction device, which could produce thrust via the pressure of that obscure radiation? I think? Dr. Mike McCulloch has a theory that he claims can explain why the EmDrive could be producing thrust when so many people say it can’t. However, instead of solving the EmDrive puzzle, for me his claims only raise even more questions that need to be answered. I’ve got a lot of unanswered questions about McCulloch’s theory, not least of all because his theory would break a lot of existing physics theories without fully extending them the way that general relativity extended Newtonian mechanics. 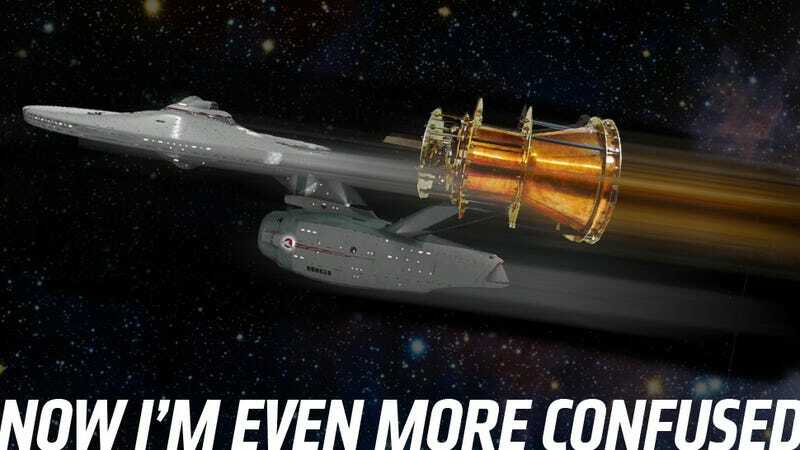 And besides, we’re still waiting on good confirmation that the EmDrive’s thrust truly exists. All right, still with me? Cool. Let’s do this. McCulloch’s theory is called “quantized inertia,” or more formally, “Modified inertia by a Hubble-scale Casimir effect.” To explain his theory, I need to talk about quantization. The ways the guitar string can vibrate are quantized. There’s a limited and regularly-spaced set of modes the wave can take. McCulloch’s theory involves a similar kind of quantization, except he’s talking about quantized waves inside a cavity. And instead of vibrating guitar strings, he’s talking about waves of electromagnetic radiation that only appear when you’re speeding up, thanks to something called the Unruh effect. If you accelerate in space, where there’s no atmosphere or other particles around, then you’ll see space around you appear to get warmer. You’ll be heated up by particles that, if you weren’t speeding up, you wouldn’t experience. In other words, if you strapped a thermometer to a rocket and let it blast through space, it’d record a warmer temperature than one that wasn’t blasting through space. It’s a weird consequence of quantum mechanics, but it’s a well-accepted one. If this is true, then general relativity is broken. Here’s where McCulloch’s theory comes in. McCulloch claims that something being accelerated will encounter more Unruh radiation coming at it head-on than it will from behind, pushing back against its acceleration1. This, McCulloch claims, is where inertia comes from. He also claims that, when an object’s only accelerating a little bit, the Unruh radiation coming at the object head on decreases, so it doesn’t experience as much inertia as normal. If this is true, then general relativity is broken. For general relativity to work, inertial mass and gravitational mass have to be the same. “Wait,” you may be saying, “there are different kinds of mass?” Yep! A bathroom scale measures gravitational mass: how much the Earth pulls on an object compared to an object whose mass is known, like the standard kilogram. Inertial mass is a measure of how much an object resists being accelerated by a force. An object with more inertial mass will be accelerated less by a force than an object with less inertial mass. General relativity claims that the two are exactly equivalent. According to general relativity, if I put you in a closed elevator, you can’t tell if you’re being accelerating through space at 9.8 meters per second squared, or if I’ve put the elevator on the surface of the Earth where gravity is accelerating you by 9.8 meters per second squared. McCulloch’s theory claims that gravitational mass and inertial mass can be different. Your inertial mass depends on how fast you’re accelerating. At low accelerations, your inertial mass is supposedly less. Experimenters have tested to see if the gravitational and inertial masses are the same lots of times. We’ve even looked for a the difference by effectively dropping the Earth and the Moon towards the Sun As far as we can tell, gravitational mass and inertial mass are the same to a ridiculously high precision. It’s always possible that McCulloch is right, assuming that the EmDrive’s anomalous thrust actually exists. But right now we have no good confirmation of the EmDrive’s thrust. Since I last talked about the EmDrive at Jalopnik, Paul Marsh of NASA’s Eagleworks has posted on a forum that an updated peer-reviewed paper is coming. But until that paper comes out, we don’t know much more than we did back then, and the EmDrive’s thrust remains speculative. To me, McCulloch’s attempt to explain the EmDrive feels similar to how, in the wake of the discovery that the Pioneer space probes were being slowed down by a constant deceleration, scientists came up with all kinds of possible explanations for the Pioneer anomaly. But when researchers recovered a lot more data from the probes, they found that the deceleration wasn’t constant like they’d originally thought. Eventually they found that thermal effects from the spacecraft’s power sources and internal battery were the most likely explanation for the slow-down. The EmDrive could really be producing thrust, and Mike McCulloch’s theory could truly explain that thrust. I hope they’re both true! New physics is great! But without more solid proof, I’m not ready to accept either of them just yet. McCulloch’s reasoning has to do with something called the Rindler horizon. When you’re constantly accelerating, there’s a boundary behind you in a combination of space and time where nothing, not even light, can catch up to you. McCulloch claims that the radiation will be quantized between you and the Rindler horizon behind you, and it’ll be separately quantized between you and the Hubble horizon in front of you. Because the Rindler horizon’s a lot closer to you than the Hubble horizon (which is near the edge of the observable universe), you can’t fit as many different quantized modes of radiation between you and the Rindler horizon behind you than you can between you and the Hubble horizon ahead of you. In the guitar example, it’s the difference between holding a fret near the body versus far out on the neck. I’m extremely skeptical about this, because it’s not clear at all why you’d act like a finger on the guitar string. If anything, I’d expect the waves would only be quantized between the Rindler horizon behind you and the Hubble horizon in front of you, without you being involved at all. Because the universe is expanding, you can draw a boundary around us in space called the Hubble horizon. Inside that horizon, galaxies are moving away from us slower than the speed of light. Outside that horizon, galaxies are moving away from us faster than the speed of light. This doesn’t actually violate general relativity, though if you want to really understand why, I’d suggest reading Vanessa Janek’s explanation of why. So, at this point, I’m still not sure that this new explanation really manages to clear anything up, and I’m still sort of leaning on the side of this would be nice, but it feels impossible. I’m hopeful, though—soon we’ll have that real, peer-reviewed study, and hopefully we’ll know what’s going on. This is either an interesting dead end, something genuinely new, or, I suppose, some grand mystery.